Chia seeds are magic. I've been eating them in granola, sprinkling them over salads, and like this. 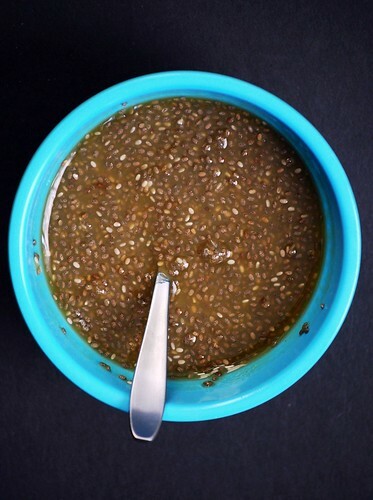 If you put chia seeds in water, or other delicious liquids, they gelatinize. Is that a real word? Either way, there's something special about chia seeds. They're full of omegas, antioxidants, protein, iron, fiber and calcium. I've been trying to be a little bit healthier (we'll see how that turns out), and having a snack of chia 'pudding' is much better for me than my usual snacks. This requires nothing more than a little bit of time. No cooking, just two ingredients, what could be simpler? Let the chia sit in the liquid of your choice and it turns into a really interesting jell-o type thing. Combine ingredients. Let sit for 20 minutes or so, stirring once or twice. Eat! Yum! I've had chia seed mixtures but never just on their own. Definitely a must try =D. Interesting that you just made a jell-o thing with them! 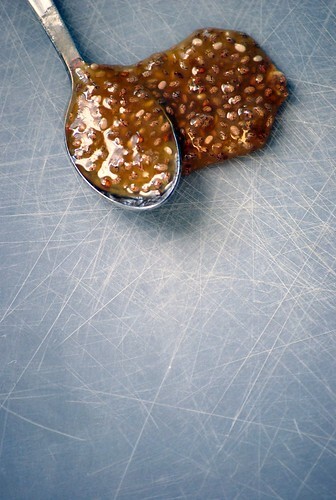 I need to find some - I seem not to digest flax seeds all that well, maybe chia seeds will be easier! cool beans! I love chia but usually them in things. I should try them by themselves. They're GREAT to bake with as well. I've been experimenting with them and they are really magical. Not to mention that they are an omega 3 powerhouse. theyre not all gooey-going because of some treatment to make them stick on your terra cotta head, are they? Thank you so much sharing the great recipe with us. And wondered about idea where we can by chia seeds?And is there a possibilty of eating too much chia seeds?What would you recommend as a daily dosage? My name is Madison and I'm a manager at NutsOnline.com. I was searching online for sites related to ours when I stumbled upon your site--and from the looks of it, your Hey That Tastes Good page is quite comprehensive and relates nicely to the products we sell. As a site that has so many recipes with diversified ingredients such as Chia Seeds, I assume that a good number of your visitors are people searching for these seeds. As such, we thought you might be interested in sharing a website with your readers where high quality Chia Seeds are available for a very reasonable price. http://www.nutsonline.com/cookingbaking/chia-seeds/premium.html within the text "Chia Seeds", so that if people are interested in buying Chia Seeds, they know exactly where to go! I feel that we can be a valuable resource for visitors to your website, and considering the relevance of your page to our product, we feel a link placement would benefit all parties. Let us know your thoughts or questions, and feel free to contact me directly via email at madison@nutsonline.com. We're more than happy to tell you more about NutsOnline and provide any follow up detail. Agua Fresca de Chia is evidently a very popular South American beverage - make a lemon or lime-ade, stir in chia seeds, let sit for 5 minutes, then refrigerate for at least another 10 minutes. You get a chewy, crunchy, refreshing drink with enormous health benefits. If you discover other ways to use these, please let us know! I like it with oatmeal.Like you said it makes the sauce or water thick.Sprinkle with chia and other berries.Mmmmmmmmmm...........yummy!!! Thanks to Hidalgo Foods for my chia and berries. use chocolate soy milk as your seed-soaking beverage... yum!! no guilt dessert! I bought a bunch of Chia seeds and they are not too gross in my smoothie if I drink it right away....because the thought of eating OR drinking that gelatinous goo is so gross to me! I wish it wasn't because it would be easy to do! Try it in peanut butter!